The working hypothesis for the Crows.net Project is that the American crow, Corvus brachyrhynchos, is a highly intelligent species, with fully developed language and culture. To date, the large majority of studies on the intelligence of non-human species have, either by design or default, focused on how closely the intelligence of that species resembles human intelligence. This is partially due to the difficulty of performing controlled studies, outside of the laboratory, on populations in their natural habitat. The major problem, however, has always been the relatively infrequent use, by the scientific community, of study methods that do not rely upon measuring non-human characteristics by human standards. For example, humans consider their ability to use tools to be a characteristic that "sets them above" other animals and, when a species of crows was recently found to use simple tools, this was considered to be a significant demonstration of the high intelligence of crows. In short, we tend to value in other species the traits which we value in ourselves, but since these traits are not necessarily central to the survival or culture of the other species, we generally arrive at an inaccurate or incomplete evaluation. Initially, the method utilized will consist of the collection of existing published material on the American crow and the solicitation, through this website, of personal observations of crow language and behavior. As this material accumulates, it will be published on the Crows.net website, which we hope to use as a nexus for correlating research and observations on the American crow. 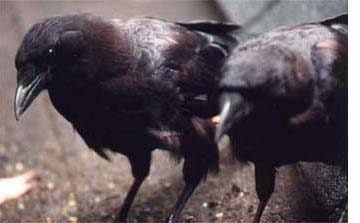 It is hoped that by taking this cooperative approach and sharing the insights of as many observers as possible, both amateur and professional, that some key information will be brought to light that will allow us all to begin the first real investigation into the language and culture of a non-human species, the American crow.